Detained immigrant children line up in the cafeteria at the Karnes County Residential Center, in Texas. She wanted to live with her aunt in Texas. She always believed that's what her mother would have wanted. Her mother died when she was nine months old, and her grandparents raised her. She's 17 years old now. "She's a very intelligent girl," says her aunt, who asked that we not use their names. She worries that speaking out could hurt her niece's asylum claim. "She always goes to church," the aunt added, as she sat in her small apartment in San Antonio, describing the many months she spent trying to win her niece's release. Typically, children asking for asylum are held by the Office of Refugee Resettlement for less than two months. Then they are released to a sponsor. That can be a parent, a close adult relative, or foster parents. Her niece didn't have an official birth certificate, so she was detained for 16 months. "I gave them every proof that I could, everything they asked for," says the aunt. The aunt says she provided U.S. authorities with proof that she and her niece were related, including fingerprints, many documents from El Salvador and even a DNA test. The niece's lawyers say they got the runaround. The lawyers also say they're not alone and that other kids have been detained longer than necessary. The lawyers say the delay violates rules on how the children should be treated. Those rules are contained in what's known as the Flores settlement, a federal court agreement dating back to 1997, said Leecia Welch, an attorney with the National Center for Youth Law based in Oakland, Calif.
"At its core, the Flores case stands for the common sense proposition that children should be raised by families and not government facilities," said Welch. Her legal group is one of two California nonprofits fighting in court to make sure the Flores settlement is followed. Under the settlement, the government agreed to release migrant children from custody "without unnecessary delay." Until then, the government agreed to detain them in the "least restrictive" setting possible. But Welch said the government isn't living up to these promises. She said children are being detained too long and that too many are being detained in secure, jail-like settings, even psychiatric facilities. "We're also seeing the Office of Refugee Resettlement place some children in facilities where they're administered very powerful psychotropic medications for weeks, months or even years without first obtaining parental or judicial authorization," Welch said. In court declarations, some children said that they have been told they have to take the medications if they ever hope to leave detention. Others claimed they have been forcibly injected. In a legal response, the government said children can be sent to more secure facilities if they are a danger or an escape risk. It also said psychotropic drugs, or medications used to treat mental illness, are used in compliance with state laws and regulations. Meanwhile, in Washington, the Trump administration has made it clear that it wants to end the protections laid out in the Flores settlement. "We urgently need Congress to pass legislation to close legal loopholes that are being exploited to gain entry into our country," Secretary of Homeland Security Kirstjen Nielsen said on Capitol Hill last month. "We need to get rid of the Flores settlement," she added. Nielsen and others in the administration believe that the current system creates a magnet for migrant children, including members of the violent MS-13 gang. They say the kids know they can come to the U.S. illegally, get released in short order, and then disappear to live here undocumented. "I think this is essentially disinformation that's being put out," said Bob Carey, who directed the Office of Refugee Resettlement during the Obama administration. It is the agency that runs the shelters and detention centers for migrant children. "Disinformation to state that the Flores agreement in any way, that it's bad law or that it compromises security when it largely relates to how children in custody are cared for," he added. A court hearing on the future of the Flores settlement and the rules for treating migrant children is scheduled for later this month. 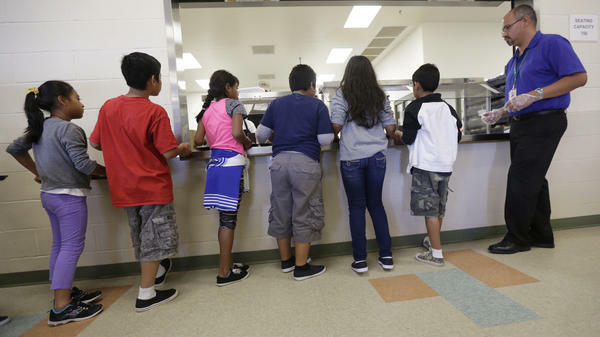 OK, so there are now more than 10,000 migrant children in U.S. government custody. These are teenagers who fled violence in Central America and children who were separated from their parents after they crossed the U.S.-Mexico border illegally. What happens to them has become the subject of controversy as immigrant advocates and the Trump administration clash over how they should be cared for. Here's more from NPR's Richard Gonzales. RICHARD GONZALES, BYLINE: One of these young migrants made the long trek from Salvador last year and turned herself in to U.S. authorities at the border. She wanted to live with her aunt in Texas. She always believed that's what her mother would have wanted. Her mother died when she was 9 months old, and her grandparents raised her. She's 17 years old now. GONZALES: This is the girl's aunt. She asked that we not use their names. She worries that speaking out could hurt her niece's asylum claim. GONZALES: The aunt is sitting in her small apartment in San Antonio. She describes her niece as very intelligent, always going to church. She also describes the many months she spent trying to win her niece's release. Typically, children asking for asylum are held by the Office of Refugee Resettlement for less than two months. Then they are released to a sponsor. That can be a parent, a close adult relative or foster parents. Her niece was detained for 16 months. GONZALES: Her niece didn't have an official birth certificate. The aunt says she provided everything U.S. authorities demanded to prove that she and her niece were related - fingerprints, a lot of documents from El Salvador and even a DNA test. The niece's lawyers say they got the runaround. The lawyers also say they're not alone, that other kids have been detained longer than necessary. And they say this violates rules on how the children should be treated. Those rules are contained in what's known as the Flores settlement, a federal court agreement dating back to 1997. LEECIA WELCH: At its core, the Flores case really just stands for the commonsense proposition that children should be raised in families, not government facilities. GONZALES: Leecia Welch is an attorney with the National Center for Youth Law, one of two California nonprofits fighting in court to make sure the Flores settlement is followed. Under the settlement, the government agreed to release migrant children from custody without unnecessary delay. Until then, the government agreed to detain them in the least restrictive setting possible. But Welch said the government isn't living up to those promises. She said the children are being detained too long and that too many are being detained in secure jail-like settings, even psychiatric facilities. WELCH: We're also seeing the Office of Refugee Resettlement place some children in facilities where they're administered very powerful psychotropic medications for weeks, months or even years without first obtaining parental or judicial authorization. GONZALES: In court declarations, some children say they've been told they have to take the medications if they ever hope to leave detention. Others claim they have been forcibly injected. In a legal response, the government says children can be sent to more secure facilities if they are a danger or an escape risk. It also says psychotropic drugs or medications used to treat mental illness are used in compliance with state laws and regulations. Meanwhile, in Washington, the Trump administration has made it clear that it wants to end the protections laid out in the Flores settlement. KIRSTJEN NIELSEN: We need to get rid of the Flores settlement. GONZALES: That's the secretary of Homeland Security, Kirstjen Nielsen, on Capitol Hill last month. NIELSEN: We urgently need Congress to pass legislation to close legal loopholes that are being exploited to gain entry into our country. GONZALES: Nielsen and others in the administration believe that the current system creates a magnet for migrant children, including members of the violent MS-13 gang. They say the kids know the deal. They know they can come to the U.S. illegally, get released in short order and then disappear to live here undocumented. BOB CAREY: I think this is essentially disinformation that's being put out. GONZALES: Bob Carey was a head of the Office of Refugee Resettlement under the Obama administration. That's the agency that runs the shelters and detention centers for migrant children. CAREY: Disinformation to state that the Flores agreement in any way, you know - that it's bad law or that it compromises security when it largely relates to how children in custody are cared for. GONZALES: A court hearing on the future of the Flores settlement and the rules for treating migrant children is scheduled for later this month. Richard Gonzales, NPR News. (SOUNDBITE OF KIASMOS' "DRAWN") Transcript provided by NPR, Copyright NPR.